The State of Israel was born in 1948 and a British legation was established in Tel Aviv the following year. A discreet house at 2 Simtat Hama’alot Road in Ramat Gan was bought freehold for £32,000 from the Lieberman family as the residence, requiring ingoings of about £13,000. It has been extended several times over the years. For the offices, a site at 192 Hayarkon Street, with a block of flats under construction on it, was bought in 1949 for £34,500. The building was finished off to five storeys of offices to the Ministry of Works’ requirements in 1950 for a further £12,000. The adjacent site at 190 Hayarkon was bought in 1961 for £18,500 and an office extension completed on it in 1967, built exactly to match the slightly remodelled 192. An attempt was made in the mid-1980s to acquire a site and build a new residence but the costs and other difficulties became overwhelming. Comparable difficulties beset the possibility of new offices in the 1990s. 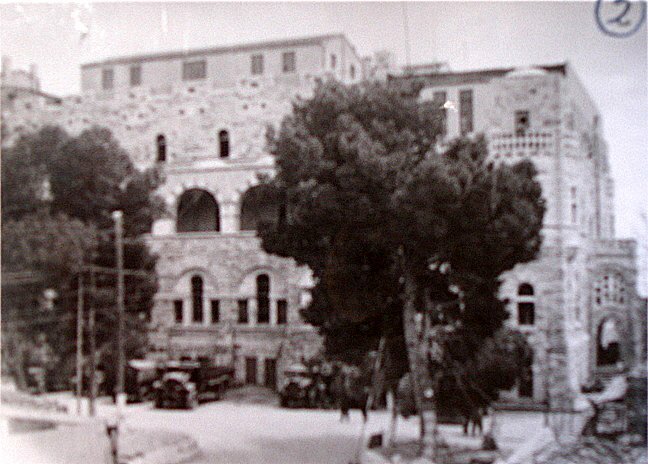 The consulate-general that was established in 1948 occupied a three-storey solid stone structure with an annex and outbuildings, close to the Damascus Gate, that belonged to a German Order under the direction of the Archbishop of Cologne. Formerly St Paul’s Hospice, the building was first requisitioned on the occupation of Jerusalem in 1917, and had been variously used continuously since then for government purposes, recently as Royal Air Force headquarters and then as Army barracks. 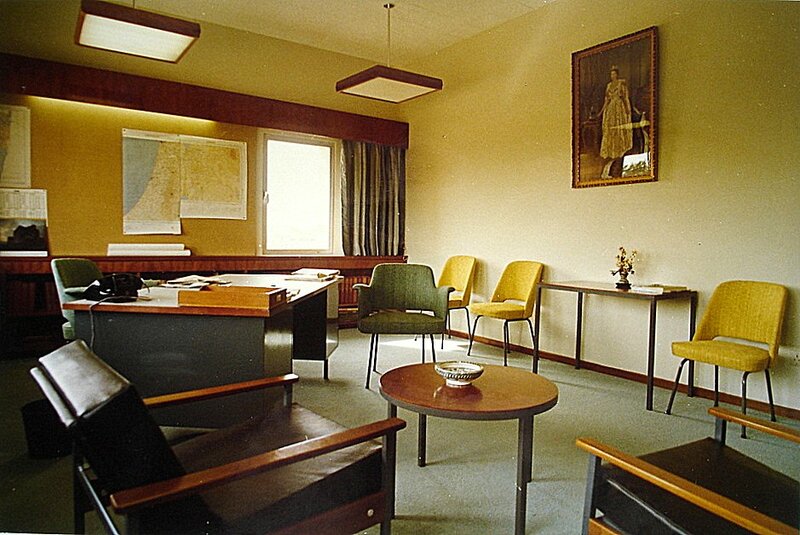 The consulate moved out of the main building in 1950 into leased premises at Larson House, on Nablus Road. In 1952, there were distinct signs that the legation (which became an embassy in that year) would need to move from Tel Aviv to Jerusalem, and a search for possible accommodation naturally alighted upon St John’s Hospice, for which the owning Order was said to be seeking £100,000. The Ministry of Works was flatly discouraging but the whole notion of the move evaporated before a serious argument about accommodation needed to start. 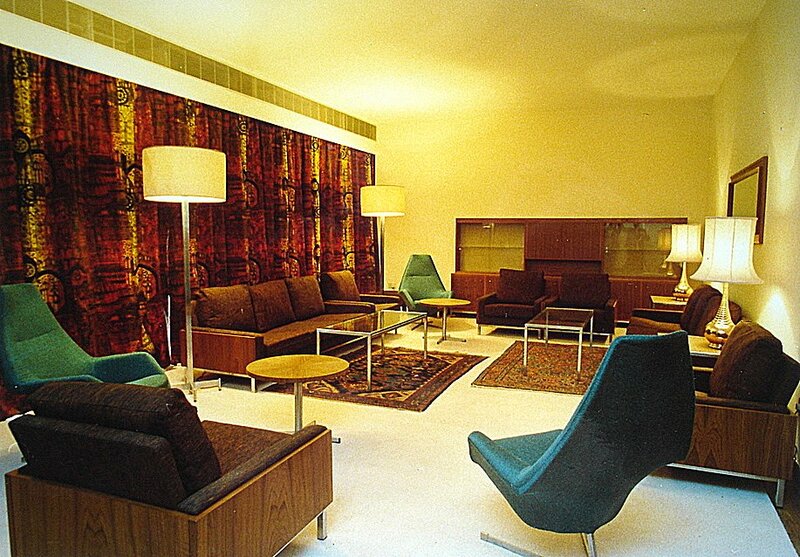 By the late 1950s, the consulate-general needed to move from Larson House [? now the Jerusalem Prayer Centre]. The Treasury rejected a proposal in 1961 to buy a site near the Mount of Olives but agreed in 1963 to the purchase for £28,000 of Plots 79, 80 and 81 off Nablus Road, later to become 19 Nashashibi Street, in the Sheikh Jarrah Quarter of East Jerusalem. 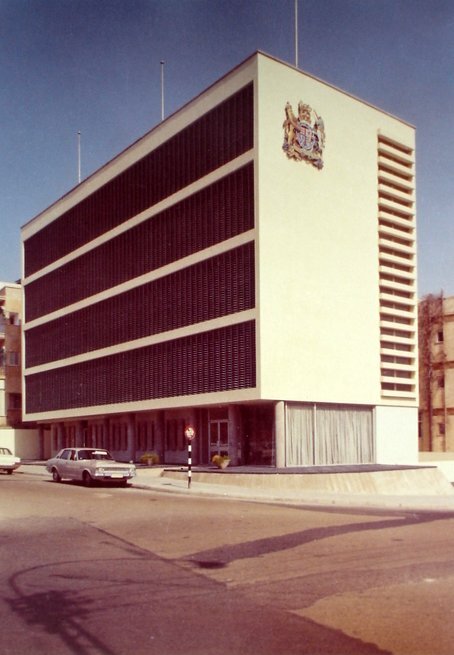 A co-located scheme comprising offices, a residence and a flat, designed by Charles Kidby of the Ministry of Public Building and Works, was completed here in 1967. St. Paul’s Hospice building, c.1950. Offices, on the left, and residence, 1968. 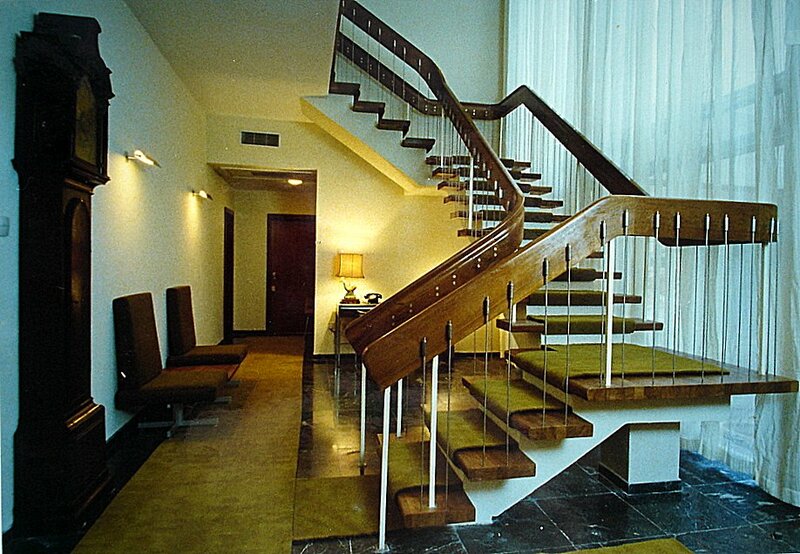 Residence hall and stair, 1968. British representation in West Jerusalem after 1952 was a consulate-general in Tower House, on Station Road, a small old stone building in the grounds of the Church of Scotland leased for 25 years from the Greek Orthodox Patriarchate. The Tower House continued to serve as a consular office in West Jerusalem [? until 2002]. The British government owns [? 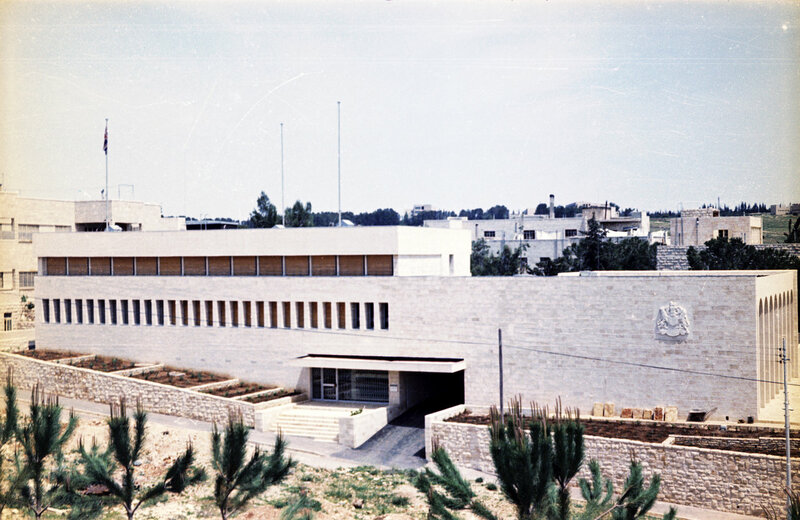 still] a 1.6 acre site, known as the Orange Plot, in Jerusalem, the freehold of which was taken over from the Ministry of Defence in 1967 as a potential site for an embassy should it be necessary to move from Tel Aviv. The site was in the former Allenby Barracks at Parcel 83, Block 30112, Jerusalem. The Orange Plot was leased to the Israeli Government at a rent of £1 p.a. for 40 years from 1948, thereafter to be renewable annually against an undertaking by the Israeli Government to make an alternative site available should one be needed for official purposes and in the event that the Orange Plot was not available when required.